I love two wheels, and have been riding a Harley as long as I care to remember. I paid almost USD $18,000 for it back in 1985. The mileage is well above 155k miles, and I use it in all conditions, even snow! An old, Japanese car works fine with me, even though I'm not particularly a fan of vehicles produced west of California (or east of the Atlantic, for that matter). For me, cars are a means of transportation; dull, boxed-in, commonplace. With one exception, a Jeep. Preferably a Wrangler. Since I first saw a CJ back in the early eighties, this has been the car of my dreams. Here in Norway, cars are hideously expensive. Together with petrol, taxes, and everything else. However, this summer I finally got hold of the car of my dreams - a Jeep Wrangler. At USD $17,200, the 2000 model was actually a bargain. It's in OK condition, with some minor rust (the authorities are salting the roads in the winter, which makes it's toll on all Norwegian cars), but not much. It's only the 2.5 liter sitting under the hood. The 4.0L is very rare and extremely expensive in Norway. I could easily have added another USD $8-$10,000 for a 4.0L on top of the $17k+ above, if I could find one for sale. is (you guessed it!) a consequence of the import taxes, which punishes larger engines severely due to environment issues. (The fact that the fuel consumption on the 4.0L lies on par or a little below the 2.5L is for some reason irrelevant for the authorities). Oh, and I forgot the registration fee. The newer the car, the higher the fee, but it applies even for older cars. 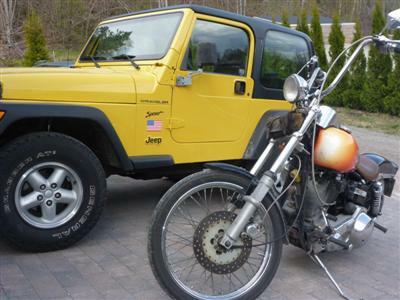 For my Wrangler TJ (10 years old when I purchased it), I paid USD $1,100, which comes in addition to the sales price above making USD $18,300 for a 10 year old, original 2.5L TJ in OK, but far from mint condition. Due to the above, I can only afford one car (besides my '85 WideGlide, which I've had since new and will never part with! 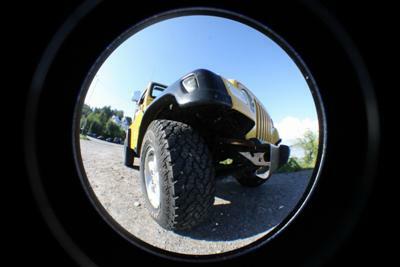 ), so I hope my Wrangler will prove trustworthy and give me many years of faithful service. So far, I do not regret anything. This IS my dream car. A truly classic, fun to drive, and a real head-turner. 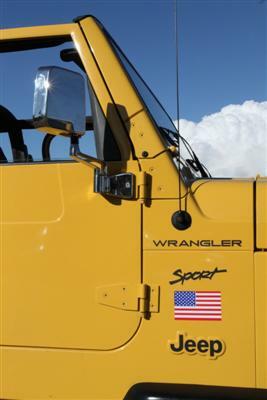 She's one of two yellow Wranglers in the whole country, and there aren't many Wranglers in total here either. My wife and kids love it as well. I've done some minor cosmetic upgrade already, but would like to trick her out a bit. The very strict national regulations limit tire size, body lift, engine size, etc., so I have to check with the local authorities I guess. So next time you complain about price levels or the limitations due to US legislation, remember this and consider yourself lucky! Larry's Comment: Hey Jan...glad you finally got your Jeep. It looks great! I too hope that we here in the USA do not get crazy government controls which limit freedoms and cost everyone through outrageous taxation and fees. Till to date I thought that the rates are high in India. Here I paid just $14,500 for a fully loaded Bolero. It is equipped with 2.5L engine, power steering, Power Disk brake, Power windows, Air conditioned and a 5 Din Music system[Radio, DVD player, MP3 player, SD Card, USB and Blue tooth] with amp., Central lock with keyless entry. $850 is the life tax [for 15-years no more tax to pay]. Less than $500 for a yearly insurance to cover cashless repair and other risks. Here Diesel cost less than a buck per liter. It gives me a mileage of 18Kms [11.5miles]. Almost roads are free to drive. Only a very few bridges we have to pay $0.10 as a toll. So you can come and live here for some time. We welcome you to see the miracle land INDIA [especially KERALA, God's own country]. Wow.. Look at the beauty of this beast. I always wanted to have a Wrangler, as I consider it as the best Jeep we have in the market, which has a modern and classy look intertwined. I don’t see anything negative about the Wrangler.